The first two seasons of Game of Thrones are some of the best television we've ever seen — and they didn't get that way by magic. 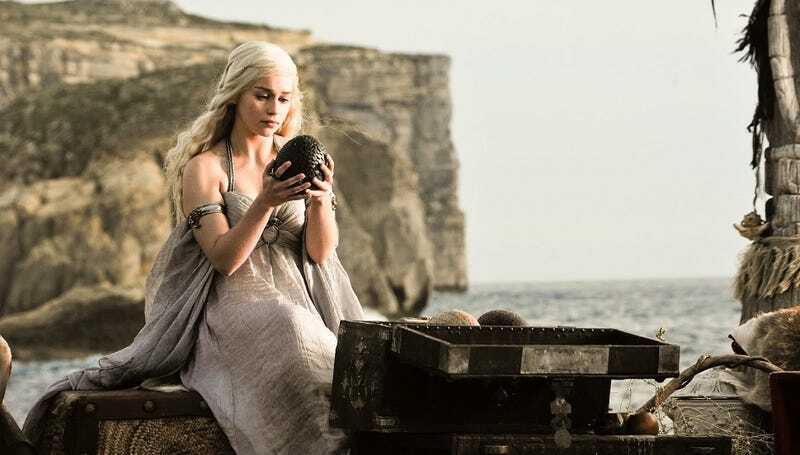 Two recent books by the show's writer Bryan Cogman reveal some of the tough decisions that had to be made during the production process: including some deleted scenes, and some last-minute additions. These two books, Inside HBO's Game of Thrones and Game of Thrones: The Storyboards, are available as a deluxe collector's edition from HBO, inside a really nice box that includes a fancy rolled-up map inside a compartment. The books themselves are really lovely. Inside features tons of beautiful photos of the filming process and tons of illustrations, and the book of storyboards has just tons and tons of pages of storyboards, including a huge swathe of the Battle of Blackwater and some other huge action sequences. Reading these books, you get a sense that the show, despite its huge budget, had to be super inventive and make lots of last-minute adjustments to circumstances. Including figuring out ways to replace sequences that weren't working. You also get a sense of just how much the cast of the show, and the army of craftspeople working on it, help to shape it. Some of the most fascinating stuff in Inside has to do with the costume design and the little details of production design. But also, the storyboards book really foregrounds the work of Will Simpson, a great comics artist who's been drawing dramatic storyboards for the show since the beginning. And the most striking part might be the stuff that got left out — or added at the last minute. The Storyboards book includes storyboards for sequences that were planned, and in some cases even filmed, but never used. For example, the first episode was supposed to start with a dream sequence showing Ned Stark's father and brother being executed brutally, at the hands of the Mad King — and there are storyboards showing Ned's brother with a rope around his neck, reaching for his sword, and his father burning on a pyre. Then Ned wakes up. Also, storyboards show an earlier version of the Tourney of the Hand, including a procession of knights, and Sansa accompanied by her friend Jeyne Poole (who was dropped from the TV series). Plus some very different dialogue between Sansa and Littlefinger, in which Littlefinger tells Sansa she has her mother's hair. Also, in the following episode, we were originally supposed to see Jaime Lannister joust with the Hound. Also, in episode six, a sequence was planned but not shot, in which Ser Gregor Clegane, the Mountain, raids a small village in the Riverlands — which helps explain why Ned Stark has been so hard on the Lannisters. In episode eight, the sequence where the Wight attacks Castle Black, only to be stopped by Jon Snow, was originally going to feature Ghost, Jon Snow's direwolf, going after the Wight, and there are some gorgeous storyboards showing the direwolf springing to the attack and biting the monster. But in the end, the direwolf had to be removed from the scene for logistical reasons. Also, the storyboards in the book show the Battle of Blackwater went through a number of different versions, including one where Stannis Baratheon is watching from on land instead of being on one of the ships. A different director was originally signed up to direct this episode, before Neil Marshall came on board, and a lot of stuff was jettisoned due to budget cuts and logistical nightmares — and then when Marshall came on board, he immediately started adding stuff back in, because he knew how to shoot a huge battle on a shoestring budget. "We loved it.... Since these scenes had not been part of the original outline of the season, they were not plot-oriented so much as character discoveries. We had the chance to spend more with some of the players we felt had been shortchanged." Among these new scenes: The bit where Tywin Lannister butchers a stag while talking to his son, Jaime. As director Daniel Minahan explains, "Up to this point you think Jaime is the most despicable person you've ever seen on TV, but when you meet his father, suddenly you understand how he came to be this way. It's an incredibly tender scene between two monstrous men, juxtaposed against the bloody evisceration of that stag." And actor Charles Dance had to learn butchery for that scene. After watching it, the producers all said, "We need more Tywin scenes." Also added at the last moment: the scene between King Robert and Queen Cersei, where she talks to him about their marriage, and whether they could ever have loved each other.